Ce document au format PDF 1.3 a été généré par XPP / StampPDF Batch 2.7 for Solaris - SPDF 1045, et a été envoyé sur fichier-pdf.fr le 08/06/2011 à 16:40, depuis l'adresse IP 1.114.x.x. La présente page de téléchargement du fichier a été vue 841 fois. Taille du document: 462 Ko (4 pages). Soto-Faraco S, Sebastia´n-Galle´s N, Werker JF (2007) Science 316:1159]. 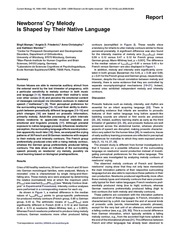 in learning of the phonemes and phonotactics of the native language. distributional patterns of the speech environment (1, 2). process them as a unified percept. investigating audiovisual integration in the early months of life. crossing the auditory and visual components of these stimuli. research; E.K. and T.T. analyzed data; and E.K. and G.C. wrote the paper. Fig. 1. Grand-averaged responses to the AV pairs VbAb (dark blue), VbAg (red), VgAb (green), and VgAg (light blue) time-locked to the sound onset at 0 ms.
between responses to VbAg and VgAg pairs within the highlighted window. composed with visual /ba/ (P ⫽ 0.0007–0.001). (P ⫽ 0.002–0.004). This inversion of polarity (Fig. 1, see also Fig. temporal areas, possibly in the auditory cortex. ⬇290 ms from sound onset over frontal and temporal areas. modality-specific differences between the responses in subsequent time windows. ms for /ba/ before sound onset (averaged across speakers). visual influence on AV integration in Japanese participants (16). in this study is a question for future research. or permissible AV relations learned by 5 months of age. between 20.5 and 23 weeks after birth (mean age 21.4 weeks, SD ⫽ 0.8 weeks). and parents gave their written informed consent for their child’s participation. stereo soundtracks were digitized at 44.1 kHz with 16-bit resolution. stimulus, the stimulus onset asynchrony (SOA) being 760 ms.
AV stimuli by dubbing the auditory /ba/ onto a visual /ga/ and vice versa. with the consonantal burst of the original soundtrack of the video file. auditory component in both situations. stimuli. The behavior of the infants was recorded on video tape. starting 100 ms before and ending 1,100 ms after the AV stimulus onset. from sound onset up to 690 ms (i.e., 450 –1,050 ms after AV stimulus onset). correction was used where applicable. Data regarding ␥-band event-related oscillations can be found in SI Text. affect phonetic discrimination. Cognition 82:B101–B111. 2. Saffran JR, Aslin RN, Newport EL (1996) Statistical learning by 8-month-old infants. 3. McGurk H, MacDonald J (1976) Hearing lips and seeing voices. Nature 264:746 –748. 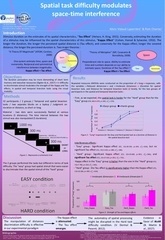 learning in 6-month-old infants. 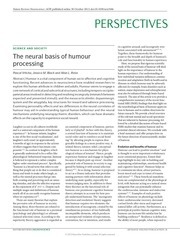 Cognition, in press. lips and voice. Dev Sci 6:191–196. 7. Weikum WM, et al. (2007) Visual language discrimination in infancy. Science 316:1159.
for infants? Dev Psychobiol 45:187–203. 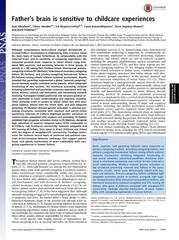 Neuroscience, eds Nelson CA, Luciana M, in press. evoked potential reinterpreted. Acta Psychologica 42:313–329. by the McGurk–MacDonald effect: A phonetic representation within short-term memory. Clin Neurophysiol 113:495–506. negativity evoked during the McGurk illusion. Neuropsychologia 45:587–597. processing of auditory speech. Proc Natl Acad Sci USA 102:1181–1186. speech perception. Dev Sci 11:306 –320. 17. 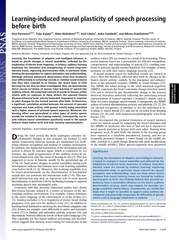 Scott LS, Pascalis O, Nelson CA (2007) A domain-general theory of perceptual development. Curr Dir Psychol Sci 16:197–201. reorganization during the first year of life. Infant Behav Dev 7:49 – 63.
first year of life? Science 296:1321–1323. 20. Lewkowicz DJ, Ghazanfar AA (2006) The decline of cross-species intersensory perception in human infants. Proc Natl Acad Sci USA 103:6771– 6774.
discrimination in infants. Nature 28:293–294. phonetic processing in neonates. NeuroReport 12:3155–3158. intelligence’’ in the auditory cortex. Trends Neurosci 24:283–288. negativity as a tool for studying higher cognitive processes. Prog Neurobiol 79:49 –71. infants. Eur J Neurosci 26:265–274. 27. Tucker DM (1993) Spatial sampling of head electrical fields: The geodesic sensor net. Electroencephalogr Clin Neurophysiol 87:154 –163. speech in the human auditory cortex. Brain Res Cogn Brain Res 13:417– 425.
activity in the human auditory cortex. Neurosci Lett 127:141–145. during audiovisual speech perception in humans: A magnetoencephalographic study. 213672) and a Pathfinder grant (CALACEI) from the European Commission. Ce fichier a été mis en ligne par un utilisateur du site. Identifiant unique du document: 00054589.